“Cartago Springs” consists of 72 legal residential parcels zoned RMH-1. Flat land, ready access to power and the highway, and abundant high quality groundwater make these sites convenient for development. A recent well measurement indicates a static water level of 8-9 feet, and when this well was drilled a decade ago, it could supply 100 gallons per minute continuously! This means that a virtually limitless supply of bottled-quality water is available with extremely low pumping costs, e.g. by solar power. Since there is so little existing development in this tract, there is the potential to create an aesthetically pleasing and functionally efficient new community here. It is also ideal for alternative solutions, including off-grid, self-sufficient, and secondary use. 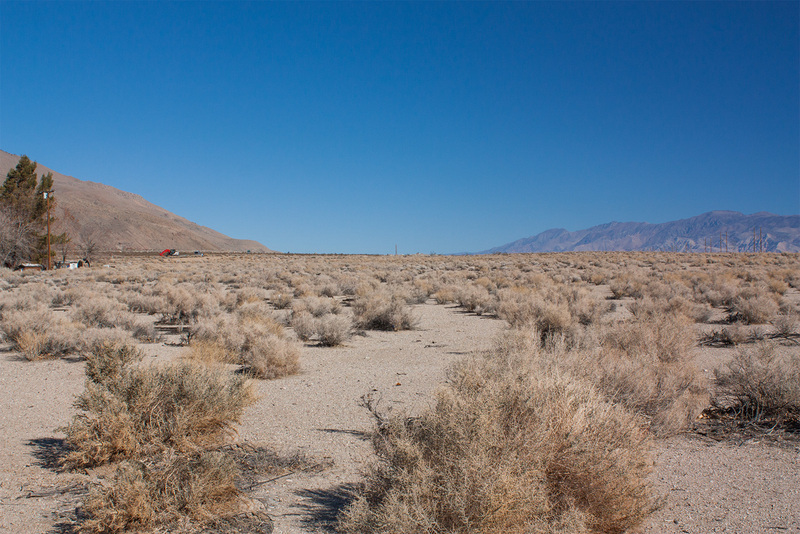 In order to qualify for Inyo County and the Lahontan Regional Water Quality Control Board’s requirements for wells and septic systems on the same parcel, individual ‘town’ lots must be combined into min. 1/2 acre parcels. Therefore, Cartago Springs offers a maximum of 24 1/2 acre+ residential sites. Currently there is one home with well, septic,and power (410 North Mojave Street) on 3 lots. The lots are typically 62 x 100 feet, so 3 lots would normally be combined to meet government requirements for a minimum of 1/2 acre to qualify for an individual well and septic system. 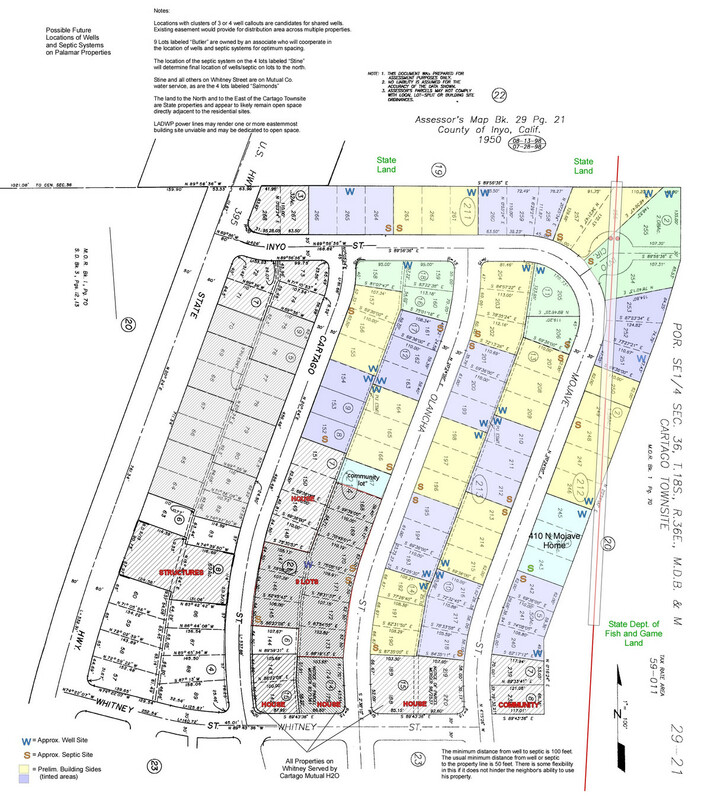 The entire subdivision is surveyed and marked. This graphic illustrates an example layout of 1/2 acre sites with spacing for individual wells and septic systems, with an option for shared wells (between four properties). 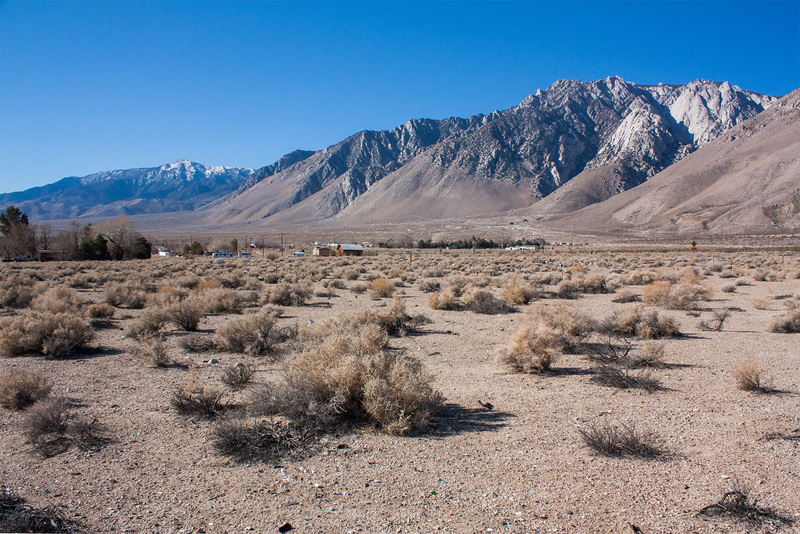 Inyo County typically requires new power to run underground. The lots to the west already have overhead service running by and may be allowed to use it. The listing price for all 66 remaining lots (twenty two 1/2 acre+ building sites) is now a reduced $178,000. These are all the color-shaded lots on the plan above minus lots 240-245, which were sold in 2015. Owner is open to partnering with developers and architects, and can offer services for County permitting, wells, power and septic system, as well as turnkey construction (having already designed and built the existing residence (sold) in this tract).